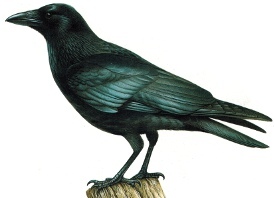 The Carrion Crow is a large glossy black bird with a broad flat topped head and a thick powerful bill. In flight it has wide square wings and square tail. Common resident breeder across most of Southern Europe and up to Denmark. 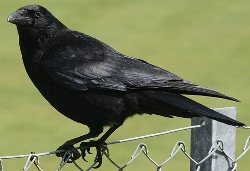 A bird of farmland parks, gardens and towns the Carrion Crow can be found almost anywhere. The Carrion Crow tends to be less likely to flock than other crows however in winter it sometimes roosts in large numbers. It's diet is very broad but it is particularly fond of carrion and scavenging and can often be found near rubbish tips in towns or in parks looking for dropped food. When not scavenging it is a ferocious predator of fledglings and can often be seen sitting quietly, patiently watching the movements of breeding birds for any indication of a nesting site. Note the heavy black bill and flat topped head of this Carrion Crow. The underside of this bird is smooth without ragged feathers like the Rook. Round tail, pointed wings, medium size, pointed bill. Greyish colour, small size, short wings. Diamond tail, fingered wings, long neck, largest crow. Square tail, medium size, short neck. Square tail, medium size, short neck, grey body.